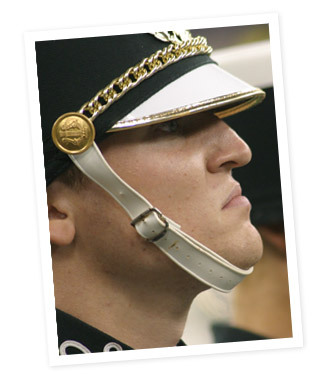 Nick Stubbs held his chin so high that his jawbone was level with the ground—a practice known in the band and around the state as “the Concord way.” Nick aspired to West Point and thought of his position in the band as the leader of an elite corps. “Nick Stubbs was Concord’s crown prince of drumming. He was a band director’s kid, a drummer’s kid, part of a family in which grown-ups actually played drums for a living. His father’s drumline had led the Richmond Red Devils to a state championship three decades earlier. Wayne and Jackie Stubbs had taken their firstborn to drum corps shows before he could walk; he started playing before he could talk. Nick’s father had bought a drumset in high school, back when blue-tinted plastic drum heads were all the rage. When Nick was a toddler, Wayne reassembled it in a corner of their basement; even then, the set was so old and battered that the name of the manufacturer had completely worn off, and duct tape held the shells together where they’d split. A framed picture that Wayne kept on his desk showed Nick grinning, his blond hair still baby-fine, perched on his father’s lap above the dingy drums. He was stretching forward over the blue plastic with a drumstick in each hand. He held the sticks like he’d been born to them.